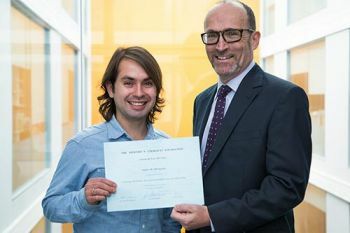 Andres Villegas was awarded the prize for scientific contributions made by promising young researchers. Andres Villegas, a fourth year PhD Actuarial Science student at Cass, has been awarded the prestigious 2015 Dimitris N. Chorafas Foundation Award for his thesis on "Mortality: Modelling, Socio-Economic Differences and Basis Risk." The winner receives a prize of $5,000 that rewards scientific contributions made independently by junior scientists in their last year of PhD thesis preparation. Prizes are awarded annually by the Swiss-based Chorafas Foundation with the goal of stimulating promising young researchers. The awards of the Chorafas Foundation are granted directly to prize winners selected by partner universities in Europe, North America, the Middle East and Asia. They are given to the best doctorate students as chosen by each partner university and confirmed by the Board of the Foundation. "I am delighted and grateful to have been awarded the Dimitris N. Chorafas Prize. This is a great incentive to continue my academic career. I take the opportunity to thank my supervisor, Professor Steven Haberman for his support and guidance during my PhD research. I am also grateful to my co-authors Dr Vladimir Kaishev, Dr Pietro Millossovich, Dr Madhavi Bajekal and Dr Andrew Hunt. I would not have achieved this award without their contribution." The prize is awarded for clarity of the work, the originality and efficiency of the proposed numerical techniques, the ability to fix previously reported limitations in the relevant literature, and the student's practical applicability. The Dimitris N. Chorafas Foundation was established in March 1992. It is a collaboration with the Swiss Academy of Engineering Sciences, Swiss Academy of Humanities and Social Sciences, Swiss Academy of Medical Sciences, and Swiss Academy of Natural Sciences. The Foundation is dedicated to rewarding outstanding performance and helping individuals complete higher degrees and significant research projects. It aims to encourage significant future contributions to science and technology.